I might as well come clean from the start. I am not a great cross-country skier. In fact, most sports that require coordination and technique are not my forte. When I went from being a runner to a triathlete, I took to the bike pretty naturally, as it just involved putting my head down and pedaling hard. Swimming was a different story. No matter how hard I flailed my arms and legs, I didn’t move very fast. It took me years to develop a somewhat more efficient technique. Cross-country skiing is similar. Growing up in an area of Germany where we didn’t have a lot of snow means that gliding sports were quite foreign to me. I didn’t skate, downhill or cross-country ski – i just ran and rode horses. But the fact that I am not very good at something has never stopped me. On the contrary, I say – bring on the challenge! Beautiful form on the descents 😉 Andrea on a downhill. Photo by Line. When I returned from Halifax to Ottawa a few years ago, I started skate skiing in Gatineau Park. Hello learning curve! It was quite a humbling exercise, but I kept on trying. 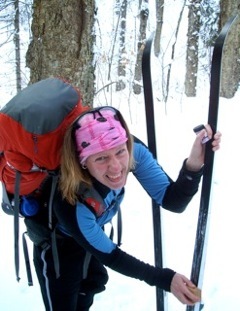 Then last year, when I heard that some of my friends were going on a back country ski trip, I wanted in on the fun. 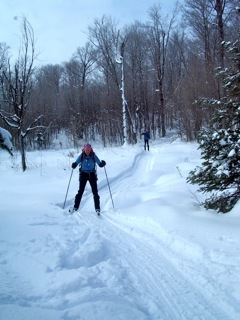 But the un-groomed trails of the back country cannot be skiied on skate skis, only on classics. This is quite a different beast again, but I picked up a pair of classic skis for $20 at a ski swap and decided to tag along. Ignorance is bliss! Little did I know how different back country skiing was from the nicely groomed trails, perfectly track set, in the park. Carrying a 29 lbs pack on your back with all your food, clothing and supplies adds to the challenge. 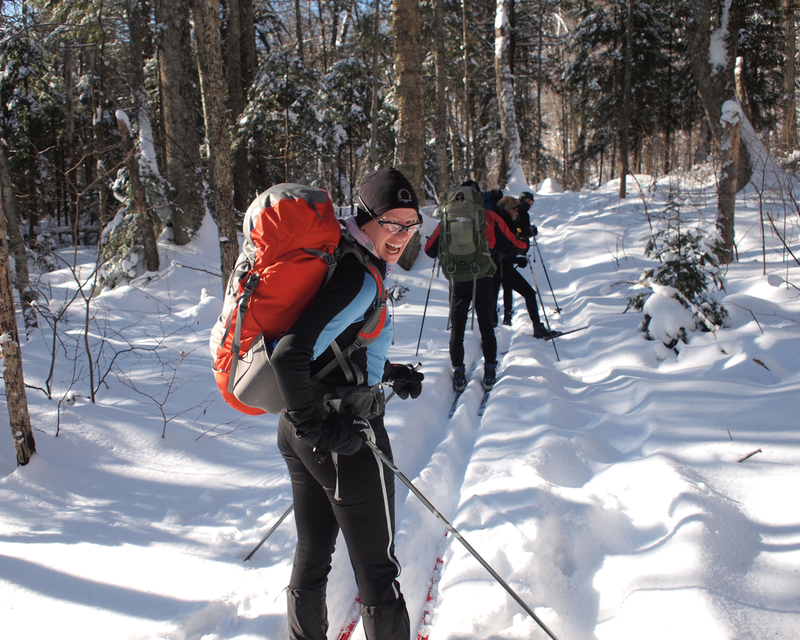 But I survived Papineau Labelle 2011 – barely and with many bruises – and returned for an encore this year. Our gang: Steve F., Christina, Andrea, Line Marc, Steve R., Gerry. Missing from the pic is Gina, our photographer extraordinaire to whom go all the photo credits for this posting. On a Friday morning, we set off on the two hour drive to the Quebec Laurentians. 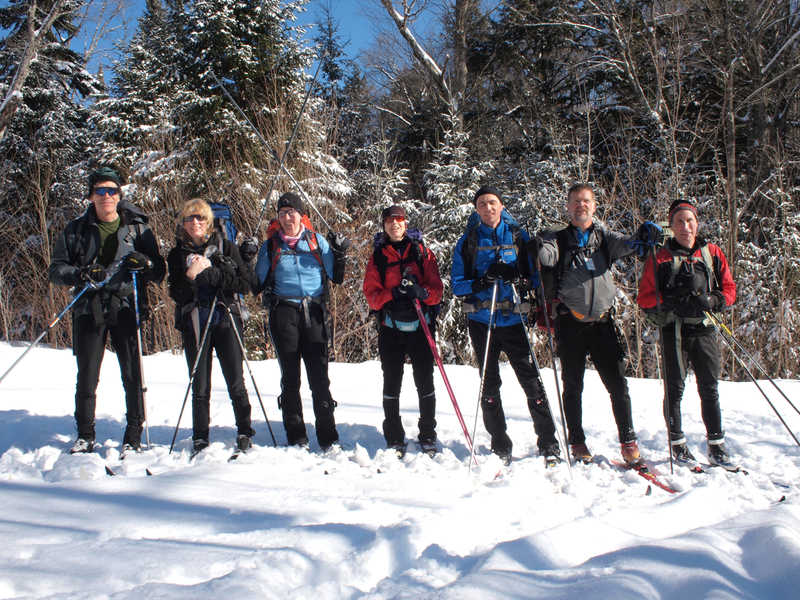 After a quick lunch at the Gagnon Welcome Centre, six of us strapped on our skis and packs and set off on the Le Ouest trail towards de l’Hôte cabin. My companions are all pretty accomplished skiers and the only things that allow me to stick with them on this trip are endurance and determination. And this time around, both were tested right from the start! Finding the right wax can be an art! Le Ouest starts climbing right out of the Welcome Centre parking lot and just keeps on going up! In spite of much debate about what kick wax to use, none of us seemed to have found the right one, as there was almost as much sliding back as there was climbing up. On the really steep sections we herring-boned or side stepped our way up, but this was also tricky, as the path was quite narrow and the snow was very deep. A crusty layer of ice added to the difficulty and getting an edge caught was easy. Planting poles did not result in the desired push, as they just disappeared into the snow. Kick wax was reapplied periodically and I think we covered the entire colour spectrum, but nothing worked too well on the ice-crusted snow. We laboured on, with Steve F. breaking trail at the front. After one and a half hours of hard work, we stopped in a level clearing to have a snack. To my horror, we discovered we had covered a mere 2.5 kilometers! I made a silent wish that the terrain would get easier or I’d reach the cabin only late at night. My wish came true and we reached some flatter trails. This helped us pick up the pace tremendously and we reached the de L’Hôte cabin well before it got dark. Nonetheless, we got in a good five hours of skiing. It took a while to heat up this large cabin. We lit both wood stoves as well as the huge cast iron stove in the kitchen, then changed into some dry clothes and voilà – we were ready to get the party started! 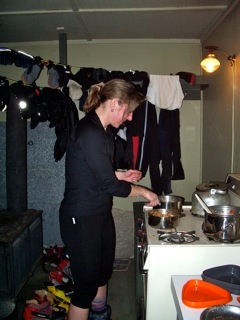 Line was in charge of making dinner the first night and quickly got ready to cook the pasta and veggie sauce. We had worked up an appetite and everyone was eager to get their bottles of wine on the table. 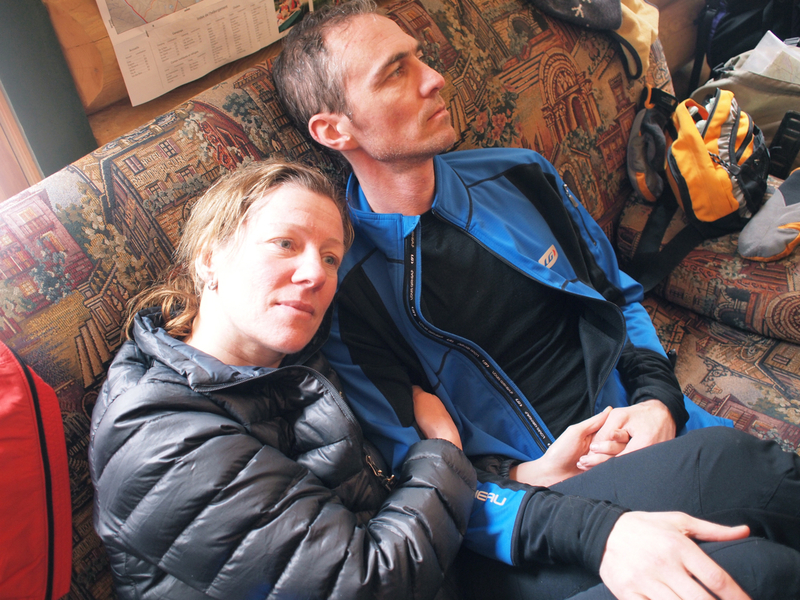 If yours were consumed the first night, you didn’t need to carry them on your back during the ski the next day. This makes for a generous crowd! Gerry had shown up late for one of our training skis a couple of weeks before the trip and the assigned punishment was bringing a bottle of Bailey’s to Papineau Labelle. Being the gentleman he is, he came through. After dinner, two more members of our little group arrived at the cabin. Steve R. and Christina could only leave town after work on Friday. This was good news for the rest of us, as it meant they could bring along some ice cream, so Christina could serve up her delicious Poire Hélène dessert. In an effort to lighten Gerry’s load for the next day, we added some Bailey’s to the chocolate sauce and ice cream. Whoever said you need to rough it in the wilderness?? Ahhh, coffee to get us going in the morning! The next morning, Marc and I were tasked with making breakfast. 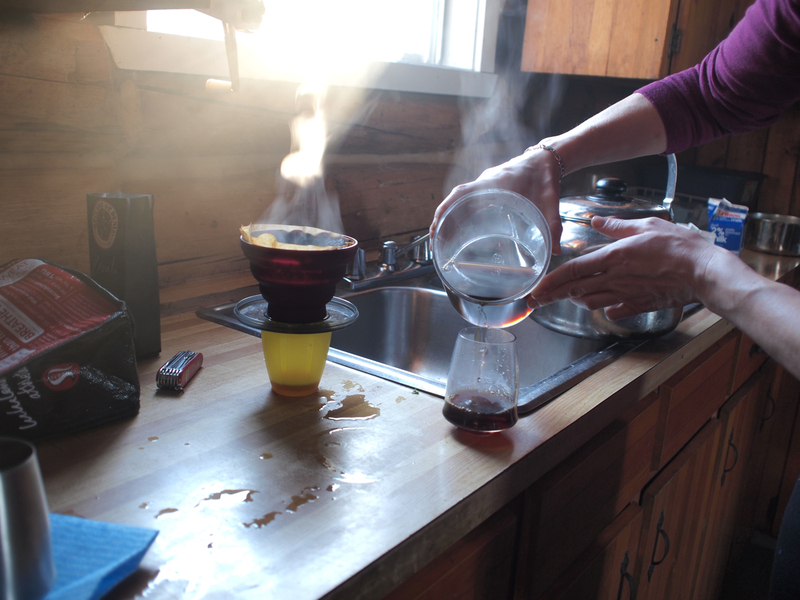 We cooked up some bacon and omelettes and brewed pot after pot of coffee. Somehow all the Bailey’s had disappeared the previous evening even though everybody claims to have had only a small glass. The cabin was still a bit warm, as everyone who had to get up to go to the washroom at night had thrown another log on to keep the fires going. We got started a bit later than we had planned, but had another great day for skiing with relatively mild temperatures and sunny skies. Each of us had packed a little lunch bag full of goodies courtesy of Gina, so we had fuel for the road ahead. Aero bars, Lindt chocolates and a few other treats rounded out the sandwich, carrot and pickle offering. If I thought I could shed a few pounds on this trip, I was clearly mistaken! Day two was characterized by lovely back country trails that had us going up, down, left, right and over bumps as if we were on a roller coaster. Rock ’n Roll! This is all good and well for those who ski well, but for yours truly, day two proved to be a real challenge. While day one only required strength and determination, day two definitely demanded skill. We’ve already gone over this part, so you can imagine how I fared. My mission to stay upright became further complicated by the fact that the trails were rather narrow as well as icy, so my fall back position – the snow plow – was not at all accessible. Needless to say, I fell – not once or twice, but countless times. Face plants, left side, right side, on my knees and any other variation – I delivered entertainment to the group. My falls on the particularly twisted sections were often accompanied by cries of “Woman down!” to alert the next person that I was spread-eagle across the narrow trail. Have you ever tried getting up with a 29 lbs pack on your back and two long planks of wood on your feet? Not an easy feat! This is made more complicated by the fact that when I put my hand on the snow to push myself up, my arm would disappear all the way to the shoulder into the deep snow, nose still firmly planted on the snow’s surface. To avoid wasting huge amounts of energy, it’s sometimes best to just stay down and wait for someone to come to your rescue. While I was by far the least experienced skier, I was somewhat comforted by the fact that my friends made a few crash landings, too. Even Swiss Miss Christina, who grew up skiing the Swiss Alps, needed to be pulled up by the back pack on occasion. But after another five hours of skiing/sliding/stumbling, we all made it to L’Averse, our cabin for the second night. 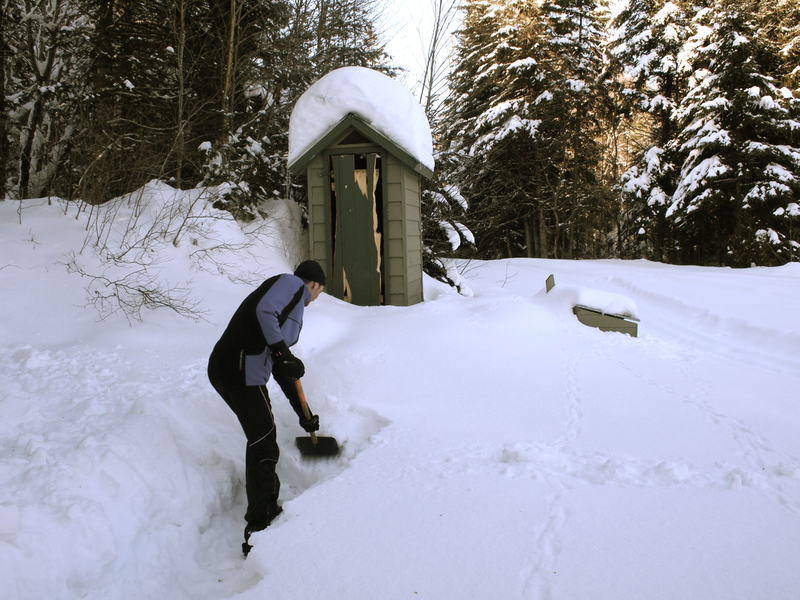 We settled in and after Marc shovelled a very important trail, we began cooking dinner. Quinoa, veggies and chicken – yum! Of course there was more wine that had to be consumed to lighten the load and to soothe the aching muscles. And there was some frolicking in the snow in our ski underwear as well to celebrate the fact that I had survived another day! On day three, we had to be sure to get an early start, because we had a long route ahead. We got up early and Steve F. was already cooking oatmeal to get us fuelled up for the last stretch. The park wardens who had checked on us the previous night told us that except for the first couple of kilometers of unbroken trail, the rest was going to be broken by their skidoos. This meant that while there were no tracks, at least the snow would be flattened, making our progress a lot easier and faster. We again packed our lunches, courtesy of Gerry, and set off. The first couple of kilometers, Uber-Steve F. was again breaking trail, impressing us all with his fine form and strength. There were some fast rock ‘n roll sections that even saw Steve F. stumble. Not to mention, he got a few branches in the face where small trees were sprawled across the trail weighted down under the burden of the snow. We followed behind in a conga line. Once we finished the section of unbroken trail, we reached some of the wider trails and roads. Now we were cruising and we soon got to our half way point. We stopped at Gauthier cabin for lunch instead of just halting to eat on the trail. This was pure luxury, especially since someone must have been there just before us and the fire was still glowing in the wood stove. We ate, had a little rest, and then we set off to head back to the Welcome Centre. To get through the last few kilometers of skiing, I started chanting “Poutine, poutine, poutine, poutine” in the rhythm of the “ole, ole” chant of soccer crowds. Whatever it takes to get you through… After a total of seven hours of skiing on day three, we reached the finish line and the ultimate reward was waiting! 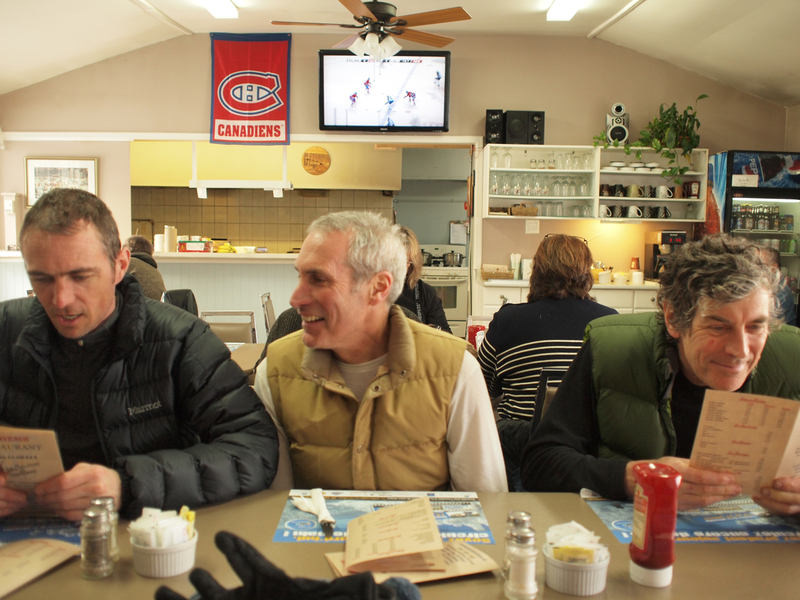 We quickly changed into some dry clothes and stored our skis and gear in the car and then drove back to the nearest town where we stopped at the Rendez Vous de Chevreuil – a small greasy spoon that serves amazing poutine! Oh, how we enjoyed those fries, cheese curds and gravy, all while watching the countless deer in the back yard that come for the feeding as well the Habs on TV. A true Quebecois experience. After all the skiing, herring-boning, side-stepping and utilizing muscles that I don’t usually engage this actively while running, this was a good 17 hours of working hard in three days. Amazing cross training for a run across the Gambia. But what’s more, it was a fantastic weekend of friendship, conversation, mutual support, excellent food and just having fun. My bruises have fainted from bright purple to pale yellow, but the memories will remain vivid for a long time. Some of these friends I have known for a good 16 years and we all met running. Our friendship continued even while I lived on the East coast and today extends to far more than training and exercise. But it is sweating together that has brought us together and that has allowed us to spent time talking about the trials, tribulations and joys of life. I think it is this bond that has allowed us to remain friends over the course of many years and over geographic distances. Here’s to old friends, mutual support and to staying fit! Looking forward to Papineau Labelle 2013 and here’s hoping that my technique will improve a little by then! 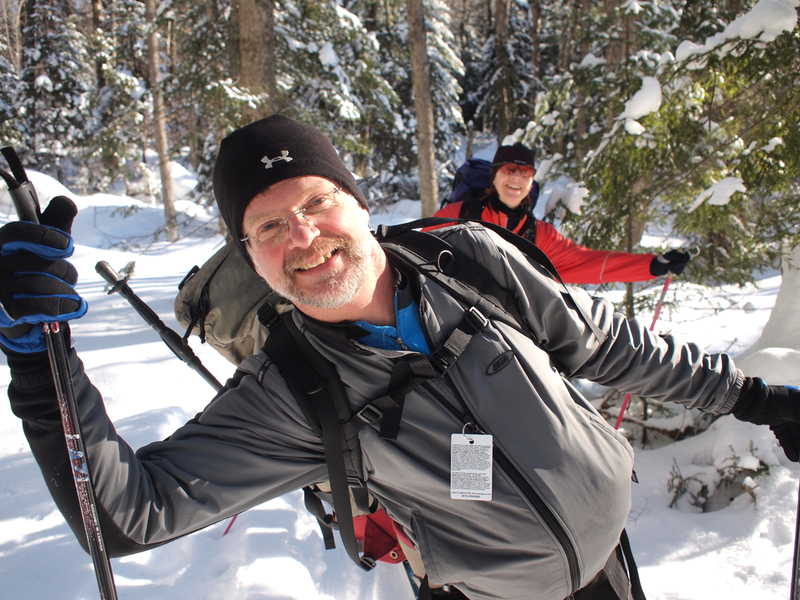 This entry was posted in Back country skiing and tagged back country skiing, classic skiing, Kamikaze, Laurentians, Papineau Labelle, Roughing it, skate skiing, x-country skiing. Bookmark the permalink.